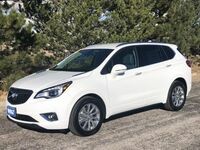 Leading the 2019 crossover market, the 2019 Buick Envision and the 2019 Honda CR-V are both highly competitive players in the industry. The two models are similar in style, with both sporting a wide stance, sculpted body and high-quality interior design. Backing up the style, the Envision and CR-V also offer their own clever set of technology and driver-assistance features to optimize the driving experience. With such a striking resemblance, it's no surprise that SUV shoppers often find themselves teetering between the pair of crossovers. That’s why we’ve decided to sort through the specs and determine once and for all which of these 2019 models comes out on top. Keep reading to learn more about how the 2019 Buick Envision and 2019 Honda CR-V compare and discover which crossover is best suited to your needs. 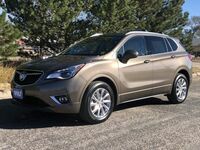 192 - 295 lb.-ft. Torque 179 - 180 lb.-ft.
Buick kicks off the Envision lineup with a 2.5-liter inline 4-cylinder engine, achieving 197 horsepower and 192 lb.-ft. of torque at the model’s base level. The CR-V's standard 2.4-liter 4-cylinder engine lacks any competitive edge, offering just 184 horsepower and 180 lb.-ft. of torque. Even the CR-V's top-tier 1.5-liter turbocharged inline 4-cylinder engine can’t match the Envision’s standard engine, with the Honda model topping out at just 190 horsepower and 179 lb.-ft. of torque. And Buick still has another ace up its sleeve. The Envision’s 2.0-liter turbocharged inline 4-cylinder engine maxes the SUV out with 252 horsepower and 295 lb.-ft. of torque. Buick’s warranty package offers more coverage than Honda’s in every dimension, offering a better basic warranty (48 month/50,000 miles vs 36 month/36,000 miles), powertrain warranty (72 month/70,000 miles vs 60 month/60,000 miles) and roadside assistance warranty (72 month/70,000 miles vs 36 month/36,000 miles). Buick makes it clear that the Envision was built to last with its outstanding warranty offerings. When it comes to Honda and the CR-V, the figures tell a different story.